Our production of Butch Hartman's "The Fairly Oddparents" has been getting a lot of attention with it's steady ratings growth towards the top of Nickelodeon. Oh Yeah! Cartoons continues its run in the top 10 on Saturday mornings; series production is moving on ChalkZone and My Life as a Teenage Robot. And the studio's starting two series pilots at the new TNN. 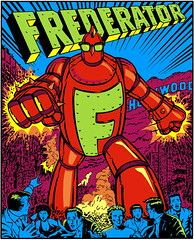 Frederator is also starting three huge projects. Two animated feature slates: five PG13 pictures for adults, and five G-rated family films. And we'll be announcing our first international pre-school project shortly. KIDS CHOOSE "ODD" OVER "SPONGEBOB"
NEW YORK -- Has "SpongeBob" got his pants in a twist? Last week, sibling skein "The Fairly OddParents," handed the porous hero his first Saturday ayem upset in 23 weeks, registering a 6.2 rating and nearly 2.5 million kid viewers. "SpongeBob" had to settle for a 6.0 rating and 2.4 million kids 2-11. With no hoopla from Nick, numbers for "Fairly Odd" has been steadily climbing. Launched in March 2001, series follows the adventures of little Timmy Turner and his well meaning, but ineffective fairy godparents. For the month, it will finish second overall in kids 2-11, behind "SpongeBob," but in front of Nick's other hits, "Jimmy Neutron" and the well established "Rugrats." "Fairly Odd" has also settled into the basic cable top 15. To date, nearly 2.9 million households have tuned in this month. Compared with last year, its Saturday ayem ratings are up 30% in both kids 2-11 and total viewers; delivery is up 29% in kids (to 2.2 million) and 38% in total viewers (to 3.6 million). "It's been working its way to this performance," said Nickelodeon's exec VP and GM Cyma Zarghami. Created by Butch Hartman, show is produced inhouse. Series began as part of channel's "Oh Yeah Cartoons" lineup and was spun off with a six-episode order for Friday night broadcasts. A steady performer, series was moved into the prime Saturday 10 a.m. slot. There are 21 completed episodes of "Fairly Odd," 19 more are in production, and Nick has greenlighted another 13. With increased episodes comes increased frequency. Next fall, Nick plans to be more aggressive with its skedding -- and licensing deals ("SpongeBob" has a $600,000 licensing purse). "We put the machine to work after we know we've got a hit," said Zarghami. "We've been tracking it really carefully, so it's not a surprise -- that it's happened so quickly is very exciting to us."